Dry eyes is one of the most common reasons a patient will visit a health care practitioner. Excessive tearing, red eyes, foreign body or gritty sensation, itchy, burning and fluctuating vision are all symptoms of dry eyes that a patient may experience. Once a patient has been diagnosed with dry eye, the course of action in treatment can be both lengthy and frustrating for a patient. By adding TearLab Osmolarity System to our practice, we are now able to treat our patients with dry eye the most efficient treatment required for the severity they experience. TearLab Osmolarity system obtains a number that ranges from mild to severe. This number allows Dr. Skouras and Dr. Byun to begin more aggressive treatment on severe cases right away, eliminating the preliminary treatments that are used on mild and moderate dry eyes. 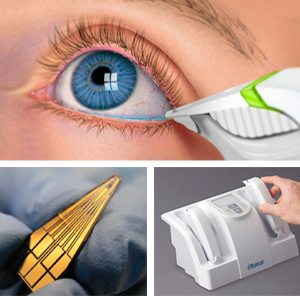 If you feel like you have symptoms of dry eye and would like to be tested to find out if you need treatment, call the Skouras Eye & Cosmetic Centre today at 416-590-0445 and book your TearLab Osmolarity Test to be on your way to clear and comfortable eyes!